Look! It&apos;s a bird, it&apos;s a plane — actually, it&apos;s a Muslim Pakistani female superhero here to save the world! Last week, Marvel unveiled the latest addition to their comic book heroes lineup: Kamala Khan. In addition to introducing more strong female characters, Marvel also hopes to promote cultural diversity. While Kamala is not the first superhero to have a religious identity, Marvel is taking powerful steps through her to help end Islamophobia. Kamala is a strong devotee and fan of the blue-eyed blonde superhero Carol Danvers, who now goes by Captain Marvel. Once Kamala discovers her powers, she calls herself Ms. Marvel — just like Danvers did when she began her superhero career. This, already, draws a connection between a traditional superhero identity and Kamala&apos;s own equally plausible origins. The most interesting part about this superhero is not her super power, but rather her cultural and religious identity. 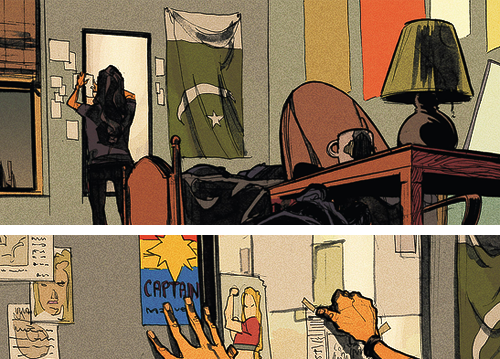 Once you remove her superhero cape, Kamala Khan is a Muslim girl growing up in New Jersey. Kamala&apos;s family consists of a conservative brother, a paranoid mother who believes that touching a boy can get you pregnant, and a father who hopes that his daughter will focus on her studies and become a doctor. Kamala is expected to face many family troubles while also juggling to take down supervillains using her shape-shifting powers. While the authors and illustrators expect backlash and some negative comments, they hope that many individuals will see the bigger picture. One of the main goals behind Kamala is to create an identifiable character. Many millennials experience an identity crisis in their 20s and are essentially trying to figure what they are. Kamala is undergoing the same kind of crisis while also trying to use her shape-shifting super power to do good. Talk about pressure. The creators of the comic are trying to dive into a new area and portray what results when familial and religious expectations are mixed with super heroics. Marvel is onto something. I believe Marvel is showing everyone that it does not matter where you come from or with which religion you identify. Instead, as a superhero or a person, each individual&apos;s goal is the same: we all want to make the world a better place. The back story of a hero helps us relate to our favorite characters, however, at the end of the day, heroes aim to help everyone realize their full potential and their purpose. As a Pakistani Muslim millennial, Kamala is a breath of fresh air. For me, its not Kamala&apos;s identity that is important. I am inspired by the fact that the comic industry does not discriminate. Kamala&apos;s identity is meant to show that Muslims are like everyone else, too — just as fitting a group for a superhero as any other. Saying you are "Muslim" has become almost taboo. This is an honest attempt to remind us all that it shouldn&apos;t matter — that heroes come from everywhere.